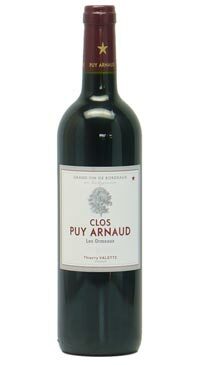 Clos Puy Arnaud is an organic and biodynamic wine estate making wine under the Grand Vin de Bordeaux Appellation. This Bordeaux is accessible and pleasing now. Aromas of blueberries, plums, cherry, chocolate and dried leaves. The palate has medium tannic structure with red fruit, mineral and tea notes in the finish. 75% Merlot and 25% Cabernet Franc.